Is replacing older fluorinated chemicals with new fluorinated chemicals the answer? For a brief period several years ago, Danish people faced a bleak prospect: life without home popcorn. Denmark’s largest grocery retailer, a company called Coop Denmark, in 2015 decided to pull all microwave popcorn from its shelves because of the anti-grease chemicals that coat the inside of the bag. Fluorinated chemicals such as PFOAs are an important component of products that are stain-resistant, grease-resistant, or waterproof, making this class of chemicals especially popular in the use of non-stick pans, the wrappers surrounding fast foods, and the paper bags that help turn kernels into oily popcorn, to name just a few. But the major problem with these fluoride-based chemicals, as researchers have documented for decades, is that they are so strong they never break down in nature. And that persistence could have dangerous implications for human health. “Chemicals that don’t break down should not be used unless they’re actually necessary,” Dr. Arlene Blum, director of the California-based Green Science Policy Institute, tells ConsumerAffairs. While plenty of food products can be packaged without fluorinated chemicals, that initially seemed an impossible feat for microwaveble popcorn. “There was just no solution in the world in popcorn,” the chemistry manager at Coop Denmark told Environmental Health News several years ago. But then, a Spanish company called Liven created the impossible; a microwave popcorn bag made with no fluorinated chemicals at all. Liven developed its bags instead with stronger paper and cellulose. 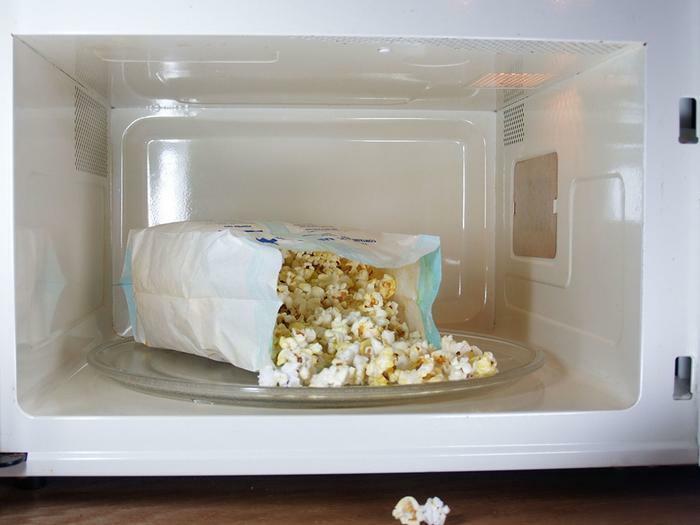 Once again, microwave popcorn could be sold on many of Denmark's grocery shelves. But other companies have for the most part phased out certain fluorinated chemicals only to replace them with different fluorinated chemicals that are bonded with shorter chains, on the premise that the shorter-chain chemicals are safer. New research indicates that this idea is sending consumers down the same wrong path. "Our idea is that we need to take these fluorinated chemicals as an entire class of chemicals that should be avoided,” Tom Bruton, a fellow at the Green Science Policy Institue, tells ConsumerAffairs. Several studies examining short-chain fluorinated chemicals found that they also accumulate in organs and in tissue, with the latest paper on the topic published this month in Environmental Science and Technology. Researchers from the University of Alabama and Notre Dame injected mice with three commonly-used short chain fluorinated chemicals and found traces of the chemicals in all of the animals’ organs, “with the highest uptake being exhibited in the liver for both [18F]PFOA and [18F]PFHxA, and the stomach for [18F]PFBA,” the researchers wrote. Regulators such as the EPA have previously been receptive to the idea of moving to shorter chain fluorochemicals. “The producers of the short-chains have stated that there’s not any health problem with the short chain because they stated that they don’t accumulate in the human body,” Blum, the Green Science Policy Institute director, tells ConsumerAffairs. Blum was not involved with this particular study, but she co-authored a paper, published in February, showing how fluorinated chemicals are still commonly used in fast food packaging. The inability of fluorinated chemicals to break down over time means that they can be found nearly anywhere scientists look, from the blood samples of most Americans to the blood samples of polar bears to drinking water supplies. That’s particularly true of communities that are located near plants producing these chemicals. In West Virginia, over 3,000 people have filed personal injury lawsuits against DuPont for polluting the water supplies with PFOA, a particularly insidious fluorinated chemical. After researchers in 2011 released findings showing a likely link between PFOA and various cancers and diseases, DuPont two years later agreed to cease PFOA production as part of a settlement with the EPA. DuPont and the rest of the chemicals industry now touts short-chain fluorinated chemicals as safer alternatives. ‘‘A significant body of data demonstrates that these alternative chemistries can be used safely,” one industry spokesman told New York Times magazine last year.